This time Yahoo got it right. Flickr 3.0 for iOS is an app of beauty. In Instagram styled fashion, we now have full screen images in a single stream for browsing. Tap twice on a picture in stream view to mark as a Favorite. Tap once to switch to a lightbox view. You can enlarge the image in Lightbox view by tapping twice. Tap the "X" to return to the stream. Easy to use and works great. Two areas that Flickr has been traditionally strong is: editing and displaying metadata. You can edit your pictures by going to camera mode and tapping in the thumbnail icon in the lower left. Choose the image by tapping on it, then tap on Next in the upper right corner. You'll have a complete set of adjustments and filters to choose from. 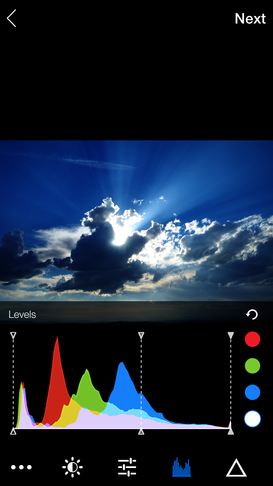 I really like having the levels adjustment complete with an RGB histogram. Tap and drag markers for highlights, mid tones, and shadows to fine tune the exposure. To see the metadata for a photo in your stream, tap once on it to switch to Lightbox mode, then tap on the "i" for the metadata display artfully overlaid on the image. This is possibly the best metadata view I've seen on my iPhone. Overall, I'm very impressed with this version of the app. Hats off to the team at Yahoo for sticking with this project.